After the solemn day of the wedding and, accordingly, the name change, comes a troublesome time of change documents. If you decided to leave your name, vain running on different instances you will still be able to avoid. Updated Russian passport, passport, health card, tax number, driving license, pension certificate, employment history, Bank card, necessary statements, photos 3,5*4,5, receipt of payment of registration fee, a certificate of marriage. First and foremost, should be to change the Russian passport. Moreover, you must do so within one month after the registration in the registry office, otherwise you will be fined. The replacement passport was happening in the passport office. You have to fill out an application, provide proof of marriage, 4 pictures format 3,5 x 4,5 old passport. You will also have to pay stamp duty in the amount of 200 rubles. The replacement passport is not limited to that time frame. But if you are planning a trip abroad, you should take care of that beforehand. To change the passport in the same place where you receive it. You need to prepare a statement of change, in duplicate. If you are employed, it is necessary to assure application. Don't forget to bring the original labor book, pension certificate. In addition, you must provide new Russian passport with the required photocopies (marriage registration, registration, change of passport), certificate of citizenship, proof of payment of a state fee is 1000 rubles, 4 color photographs of 3.5 to 4.5 and the old passport. With the change of medical policy is to pull not worth it, to change it where you receive it – to an insurance company or in the clinic to which you are attached, as well as through employer. For replacing a policy you need to have a renewed passport and the old medical policy. The pension certificate is made by the personnel Department at work. Otherwise, you should contact the Pension Fund with the statement for change of the document, the old pension and the new passport. Driver's license you should get ired at the place of residence or in the traffic police. You must have the following documents: a new Russian passport, marriage certificate (original and photocopy) medical certificate of fitness to control a vehicle, the driver card, the receipt on state duty payment, the old law. The change was after the marriage takes place in the tax office. You should provide the old certificate of tax, a statement, a copy of the marriage certificate. The shift exposed and Bank cards along with accounts. To change account you need to inform the Bank on change of name, providing as evidence a new passport and marriage certificate. Changing a Bank card, be ready to prepare the following documents: application, copy of new passport, copy of marriage certificate, old card. To change the work book in the personnel Department of the organization in which you work. 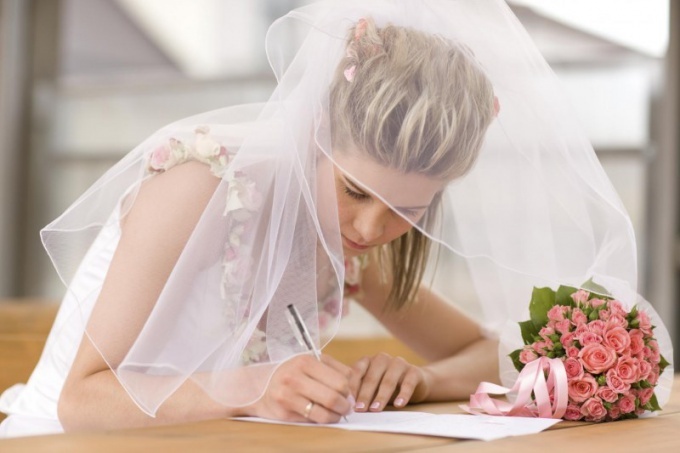 Bring in the unit documents that prove your new status - marriage certificate and passport.